... was the theme for the CC this month at Ready Set Scrap and this month I actually found the time to join in and scrap! It was an awesome CC ... lots of laughter, fun and games. All the challenges were themed to movies. Nat's was Thelma and Louise and since she fell asleep watching the movie, the only stipulation was a B&W pic. 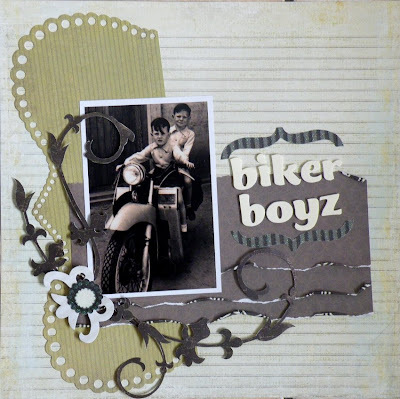 I scrapped this pic of my Dad and his brother on their dad's motorbike. Ann-Marie's challenge was to use the quote "A person is a person no matter how small" from the kids movie Horton Hears a Who. I love this pic of Cody ..... it was taken a few hours after his birth ..... check out the little fishy lips! There were 9 challenges in total and no way I could get them all done so my last choice was Rach's challenge, The Little Rascals ...... scrap a pic of the kid getting up to mischief! No shortage of pics like that around here! I chose to do a digi page for this one .... kit from Suzyqscraps. All this rainy weather is great for scrapping ..... good excuse to stay indoors. Have some monthly challenges I would like to have a go at this month so hoping to have a crack at those tomorrow. What gorgeous layouts - my fav would have to be the bottom one - love the bright colours on it. oops... tissues seem to be the flavour of the moment, we've been through boxes in the last couple of weeks, most unpacked by toddlers! 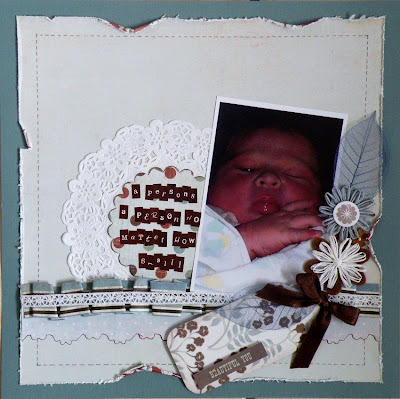 Gorgeous LO's Amanda...So glad you had fun over at RSS,you created some beautiful heartfelt LO's for the cc.